In recent years, interest in the biology, behavior, systematics and conservation of fireflies as well as a focus on ecotourism has increased dramatically around the world. As the most commonly encountered and widely recognized bioluminescent organism worldwide, fireflies serve as the model system for the study of bioluminescence. The ecological, behavioral and morphological variation found in fireflies varies widely and is documented and evaluated by a diverse, international community. The International Firefly Symposium attracts prominent individuals from around the world to disseminate and exchange information about these amazing insects. Mark your calendar and make plans to attend the 2014 International Firefly Symposium scheduled August 11-15, 2014, at the University of Florida in Gainesville, Florida, USA. 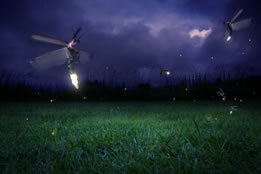 Firefly research has been conducted at the University of Florida for over 30 years, due largely to the research programs of Dr. James E. Lloyd and his students. We invite you to visit the University of Florida and be a part of our continuing commitment to learn more about this fascinating insect and its illuminating biology. This international symposium will provide numerous opportunities for participants to share up-to-date information and research and to discuss common concerns and interests. This exchange of information is vital to advancing scientific, conservation and educational efforts involving fireflies. We invite you to join us. All conference details will be posted on this web site, so add us to your favorites and visit us frequently for updates. As plans for the symposium progress, you will be able to submit your abstract, register for the symposium, and even find out about airline, hotel and other travel arrangements online. We hope you will mark your calendar now and budget funds so you can participate in this event. I invite you to contact me or our conference coordinator if you have any questions.